The Shore Line. There are various versions of this important project, but it is clear that no version should add any more road lanes. The one illustrated here is a rail only crossing, and the track doesn’t join directly with the existing rail lines. As such, it can be a completely separate technology, like the system used in Vancouver’s extremely cost effective SkyTrain [as well as elsewhere], commonly known as Light Metro. This line could be staged by first building the Aotea-Wynyard-Onewa-Akoranga-Takapuna section and keeping the best part of the busway going with a transfer station at Akoranga. One of the great advantages of Light Metro is that it can fit on the existing alignments of the busway with very little alteration, and therefore it can be extended all the way to Constellation, Albany, or beyond at much lower cost than the Standard Rail used elsewhere on the Network. 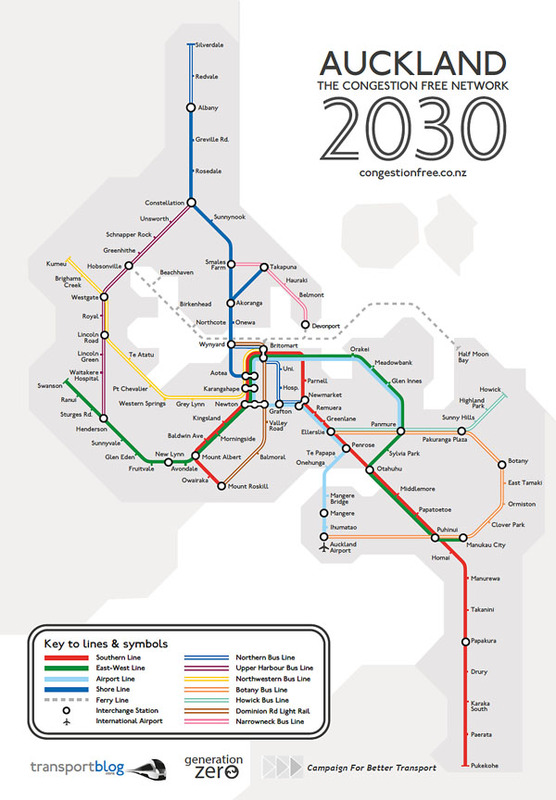 Also included here is the suggestion of Light Rail for the important Dominion Rd/Queen St bus route.